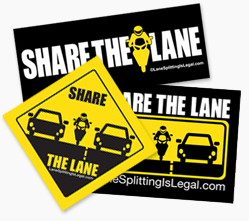 Southern California Public Radio station 89.3 KPCC ran an AirTalk segment yesterday to discuss lane splitting with Bay Area motorcycle community mouthpiece / CityBike editor Gabe Ets-Hokin and Vice President of the Motorcycle Safety Foundation Robert Gladden. It’s great to see – or hear – the non-moto media actually talking to people in the motorcycle community – most of the recent coverage has been uninformed at best. However, it’s unclear why they chose to run a photo of a Mongol rider not lane splitting as the article photo. Whatever – we’re outlaws, on steel horses we ride. I understand concern about that, I guess I don’t understand how attempting to block the motorcycle and make it worse somehow sends a message about safety. Definitely worth a listen. Check it out here.